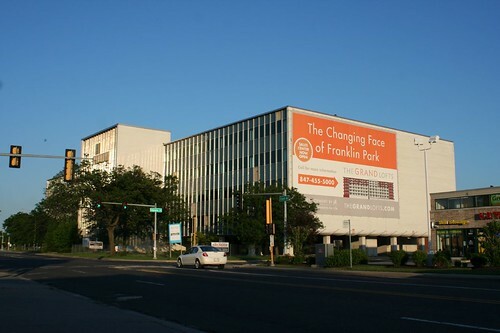 This towering MidCentury office building, at 9401 Grand Avenue in Franklin Park, looms over the low-rise suburbia and industrial facilities surrounding it. 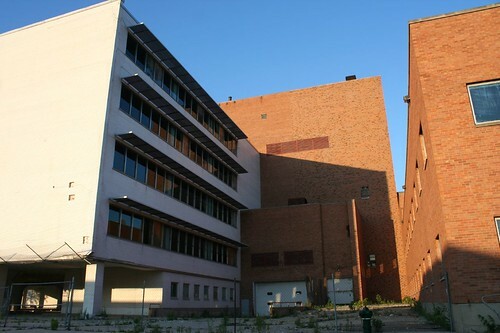 Completed in 1960, it’s a bit of hybrid – a 1950s design with 1960s colors. 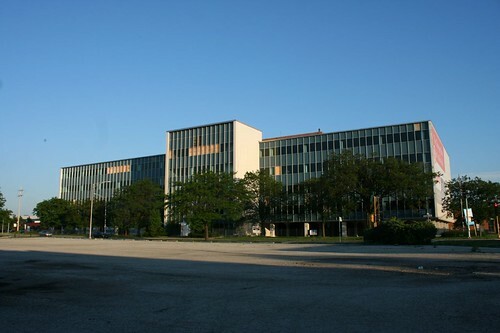 It was long the administrative headquarters of the Chicago-based Motorola company, who originally housed over a thousand office and technical workers within it. 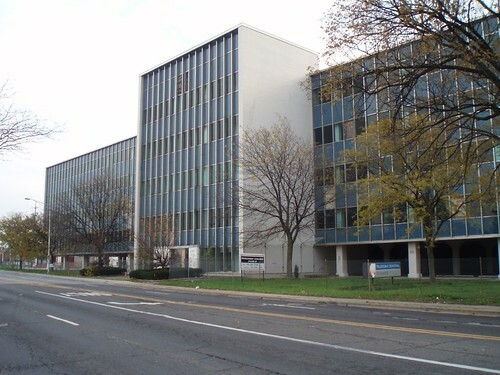 The building fronted a manufacturing operation that made TVs, radios, and stereo products; other divisions of the company worked on auto parts. An auto lift delivered cars to a 14-bay garage on the 2nd floor, made for testing car radios. A Chicago real estate blog also claims that it had a private executive auto elevator for the company president. 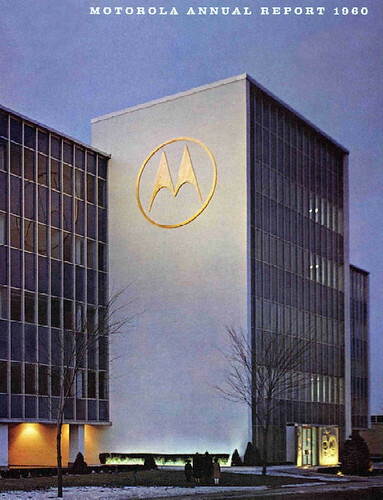 Motorola moved to Schaumburg in 1976. A 1980 ad places the Matsushita Industrial Company at the Franklin Park address. In a later life, the building was known as the O’Hare branch of Telecom Central, with a sign that still stands in front of it. Today the Motorola Building stands vacant, draped with a gigantic banner promising a total reskin and conversion to apartments. A sales office sits on the parking lot next door. The venture began in 2006 and has since collapsed. 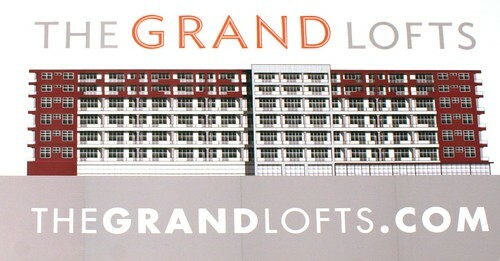 The site http://www.thegrandlofts.com doesn’t appear to be online; meanwhile, online rumors swirl of conversion to HUD housing. In fact, the longer I look at the details of the rendering, the more I think it’s pretty good, particularly if that’s not red brick on the ends. Still, the question remains of why it needs to be done at all. Is the building in its current form a masterpiece? Historically significant? No, of course not. But in equal measure, there’s nothing wrong with it, either. It has a powerful presence on the street, and gives a clean, presentable public face to all the industrial buildings behind it. 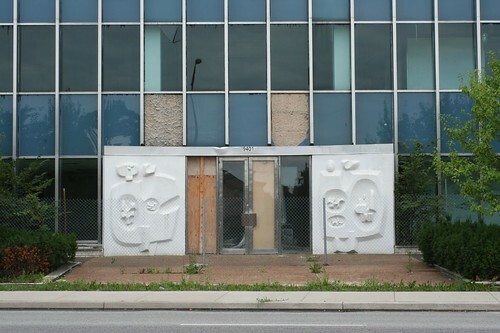 Of particular concern to me is the fate of the two concrete sculptures at the doorway. 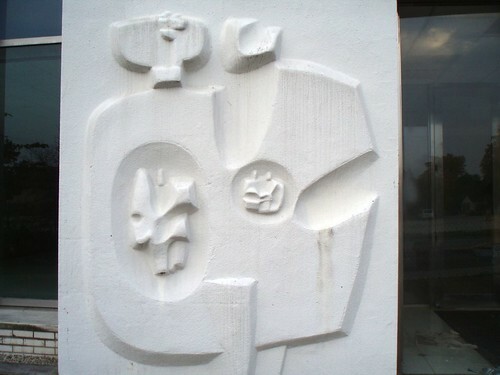 Stylized, abstract, and curvaceous, they recall the same sort of abstract works seen in certain Chicago apartment lobbies. I have no clue what they’re supposed to represent – the evolution of mankind and his telecommunicative abilities, perhaps? – but I love ’em. Now, there will inevitably be those who decry the building as an “ugly hulk” or “banal” or “bland” or “awful” or a thousand other pejoratives. To them, and to those who have attacked other Modern buildings that I cherish, I say: just look away. Just don’t look at it, if it’s that awful. Spare us the onslaught of reskins and re-dos, and save the Midcentury for those of us who can appreciate it, both today and tomorrow! Wow, didn't realize that Motorola was located over there at one time. Shame that Motorola only used the building 16 years.